Each year, termites invade millions of homes, causing billions of dollars in damage that’s rarely covered by homeowners insurance. 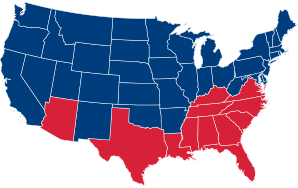 While they’re found in every state except Alaska, they are a significant threat here in the Southeast. It’s not a matter of if your home will encounter termites but when, making termite control a necessity. A thorough termite inspection and home evaluation by a licensed termite extermination professional is the first step in protecting your investment from these ravenous pests. Offering unsurpassed termite bonds since 1964, Stark Exterminators goes Beyond the Call® to protect your family's health and property while caring for our environment. Today, Stark Exterminators is proud to offer state of the art termite pest control solutions through our STEPS® Total Protection System™. STEPS utilizes our expertise in Integrated Pest Management for termite control and extermination combined with the most advanced technology available to provide industry-leading termite protection. Stark Exterminators is very proud to offer industry-leading termite control solutions to our customers. We consistently go Beyond the Call providing eco-friendly termite solutions that protect your home and property. Our STEPS® Total Protection System is the cornerstone of our service and provides the most advanced technology to eliminate termites. Stark Exterminators uses the Sentricon System with Always Active™ to protect and defend your home from termites. Widely considered the most advanced termite baiting system in the world, Sentricon provides you 24/7/365 protection with active bait in stations that are installed in the ground around your home. The Sentricon System is trusted to protect the White House, the Statue of Liberty and over two million other structures from termites. More homeowners trust Sentricon than any other brand. Termites cause more property damage every year than fires and storms combined – more $5 billion Termites primarily feed on wood, but will consume practically any wood-based product including books, furniture and even the insulation in your walls. At Stark, the first step in our process is a complete evaluation of your entire home both inside and out. We never forget that you have welcomed us into your home and will always treat your home with care and respect. The inspection begins with you sharing any signs you have noticed. Our highly trained and licensed professionals will then search for entry points, signs pest activity and any other areas of concern like high levels of moisture. Once complete, your Stark professional will review all findings with you and recommend a custom solution to meet your specific needs. Pencil-sized diameter or larger mud tubes running across bare concrete or masonry between the soil and any wooden part of your structure. Thin, small, papery wings, all the same size and shape (3/8-1/2 inch long), found on your window sills, counter tops or floors (especially in the late spring and after a recent rain). Thin, "bubbled" or distorted areas of paint or wood surfaces which feel cool to the touch. Any wooden building parts (especially if they are support structures) begin to "sag" unexpectedly. If you're experiencing any of these warning signs, a termite exterminator can help. 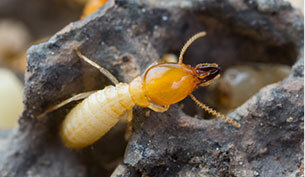 Termite control and prevention is the key to protecting your property. Working with Stark Exterminators, you will receive unsurpassed termite protection using the most environmentally responsible methods available today.